A little over a year ago we saw the launch of Anyvite, a Y Combinator funded competitor to Evite that was looking to streamline event planning. Tonight, that startup is launching a spin-off site called Tweetvite — a site dedicated to helping plan and discover Tweetups. For those that haven’t encountered the term before, a Tweetup is a real-life get together between people who use Twitter. Beyond that, the rules are flexible: Tweetups can be large events or small gatherings, can involve grabbing a few drinks or just socializing for a bit, and can be planned for in advance or spontaneous. Founder Jeff Morin says that while there are plenty of sites that cater to traditional events, like birthday and BBQs, the Tweetup niche is underserved. 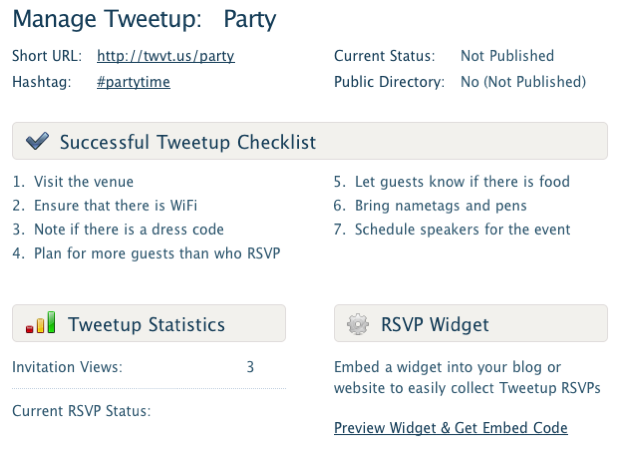 Setting up an event with Tweetvite will be familiar to anyone who has used an event site like Anyvite or Evite. To get started, you enter the name of your event, the location, who is hosting it, and other essential information. But the site includes a few attributes that you won’t find anywhere else: it asks you to designate a hashtag for the event, as well as a custom shortened URL. The site also makes it easy to Tweet out your event, or share it with other services like Facebook and MySpace. Another big difference from traditional events sites is the fact that Tweetvite offers a directory of upcoming Tweetups (given the nature in which they’re announced, they’re generally open to the public). Once you’ve created your event, you can use the site’s control panel to monitor for any tweets containing your hashtag and see how many people have viewed your page and RSVP’d. 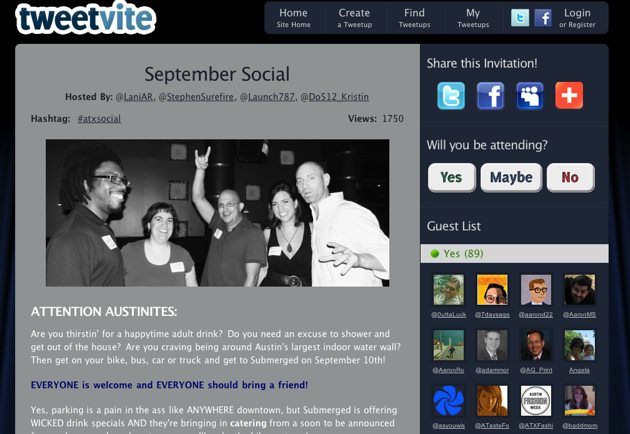 The site also offers a widget that you can embed on your blog to inform visitors of your upcoming tweetup. Tweetvite looks great, with a very polished interface and a streamlined event creation process that only takes a minute or two. At this point the biggest question in my mind is how many people actually throw Tweetups — they may be becoming increasingly popular but are nowhere near as common as traditional events are, so it may be tough to build a business around this niche. That said, Twitter is obviously still in its infancy, so the number of Tweetups may grow rapidly over the next few years.